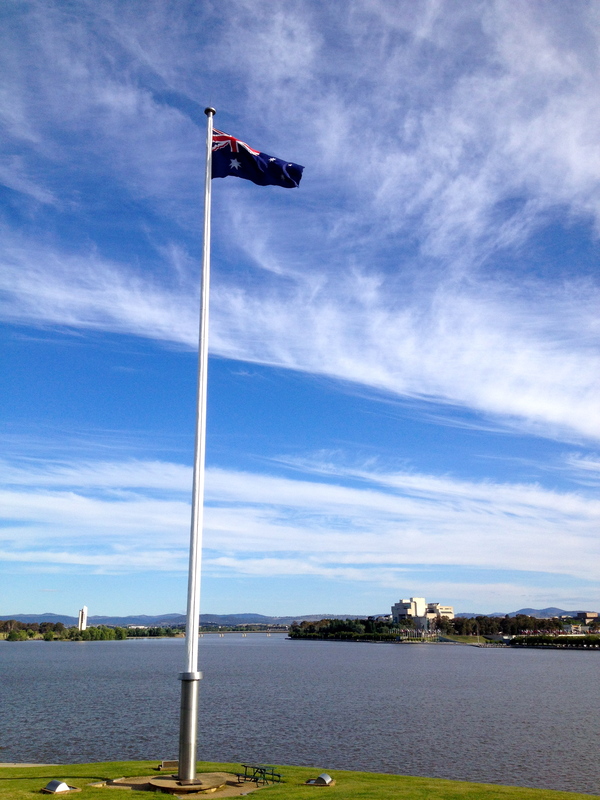 The first time I visited Canberra as an adult tourist, I practically missed it – really! For those not from Canberra and unused to its unique, hub-and-axis design, it is nearly impossible to ‘find’ any shops or schools or even the city centre (? Civic) as you drive through. However, after coming here for years for work on a fly-in-fly-out basis, I have finally started to get to know this quite beautiful planned city. Designed by Americans Walter and Marion Burley Griffith in 1912 in response to a global architectural competition to design a fitting national capital city for Australia, it was not until the 1950’s when then Prime Minister Robert Menzies decided to commit his energy, support and importantly, Treasury funds, which enabled the full realisation of the Griffiths’ original vision for the nation’s capital – including the magnificent man-made lake. 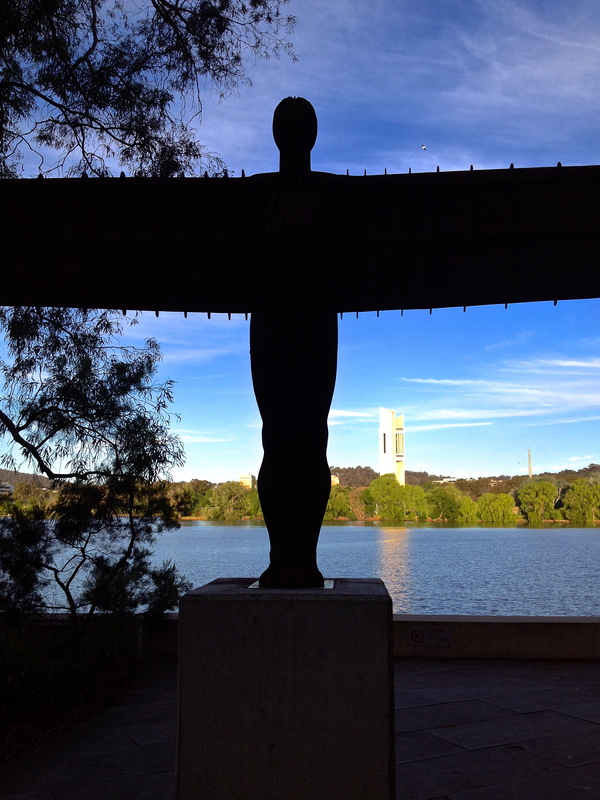 A great way to see this vision on foot, if you only have a short time here, is to take in the 5km central circuit walk around the shoreline of Lake Burley Griffith – the southern shore of which follows the RJ Menzies walk. There is great deal to take in along this walk, popular with active Canberrans on foot, bike, roller blade and even motorised skateboards! There are plenty of information plaques to keep you interested along the way. Starting at Commonwealth Park, and heading clockwise towards the magnificent National Carillion on its own island in the lake, you stroll along the Menzies walk past the enormous (128 feet) wooden flagpole made of a single Douglas Fir brought from British Columbia as a gift to Canberra from the people of Canada to commemorate the city’s Golden Jubilee. Further on there are pretty gardens with views sweeping directly across both Old and New Parliament Houses – a sight where you can really appreciate the ‘land axis’ of Burley-Griffith’s design. 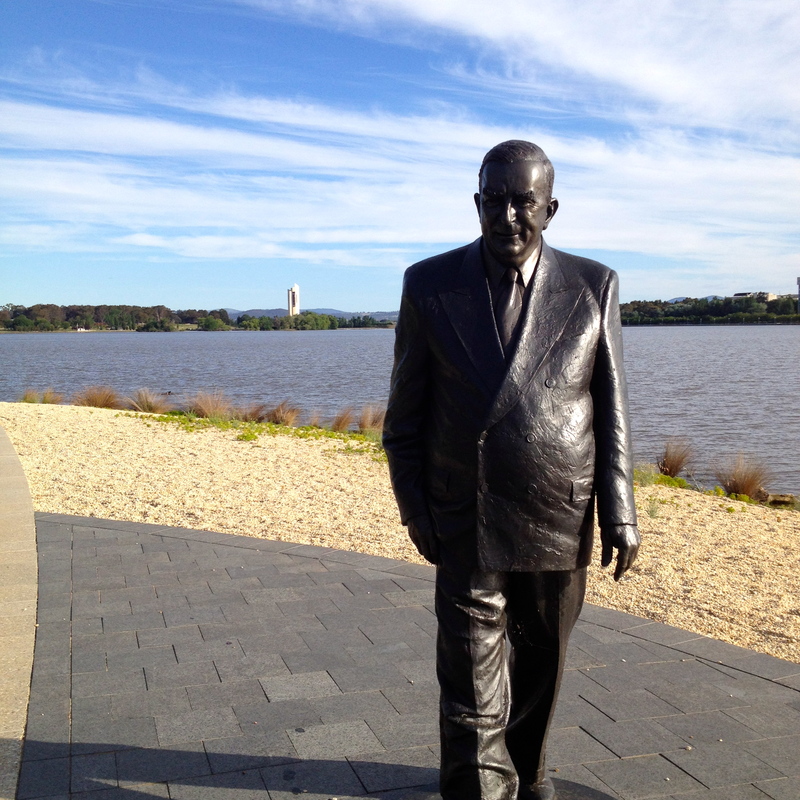 Keep an eye out for Sir Robert Menzies himself, strolling along the lakeside of his beloved lake. I was really taken with the National Carillion though, housing 55 bells in its towering geometric structure. 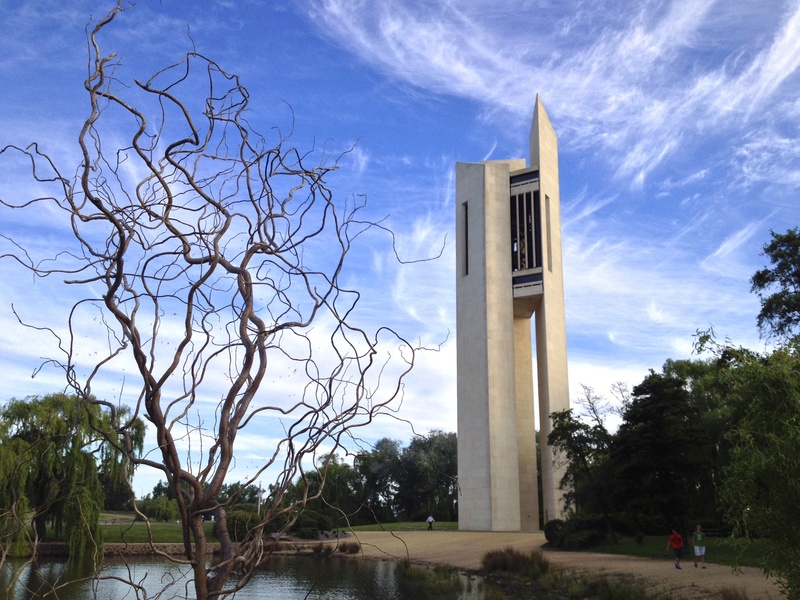 While there are regular performances by Canberra’s keen carillionists, every quarter of an hour, the beautiful bells mark out a chime. It’s early worth wandering out onto the island to enjoy the views of the tower as well as the rest of the lake. 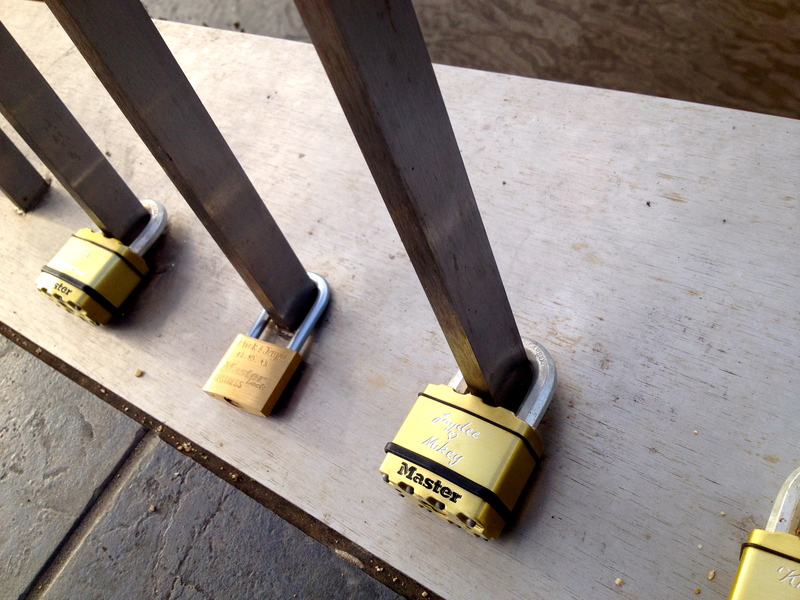 Keep an eye out for the Paris-style engraved padlocks starting to appear on the footbridge across to the island – lovers declare their love by locking padlocks onto its railings and tossing the keys into the water below. Gotta love a bit of romance! Lock it up and throw away the key, this love ain’t going anywhere! From the Carillion, head up and across the bridge and turn right to join the northern shoreline, looking bcd towards Mt Ainslie, the views across to the War Memorial and Carillion are beautiful in the late afternoon. Soon the walk takes you past the National Gallery and it’s worth detouring through the extensive sculpture gardens. Do you recognise Anthony Gormley’s Angel of North (it’s one of 5 life-size maquettes of the gigantic original which is on the M1 in the north of England)? Just past the gallery, you can stroll on the grass outside the High court. I am so grateful I live in a country where you can just wander up to such critical buildings without having to leap through, under and over all sorts of security. 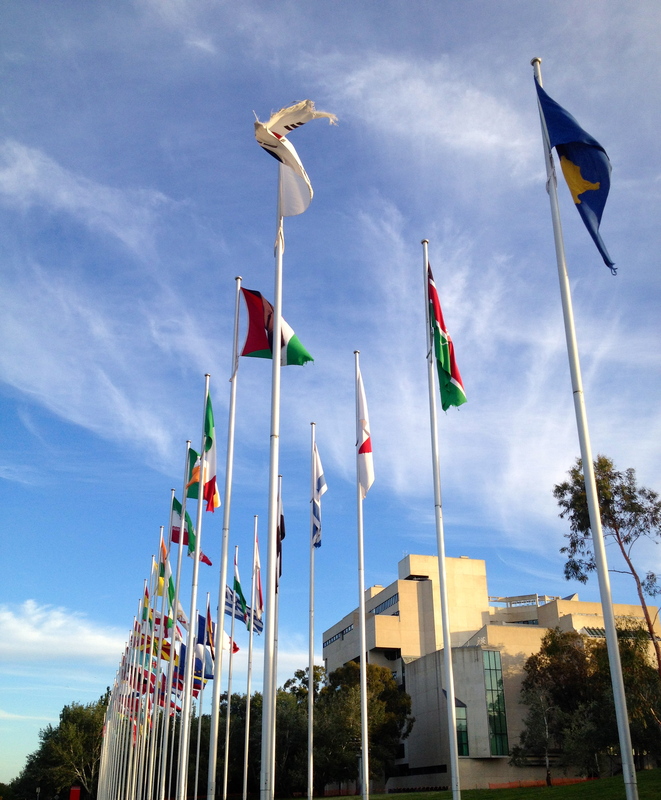 Further along and you can walk beneath the UN Flag Display – quite a fun guessing game with or without kids – providing you don’t mind craning your neck. I think I got about 20/150 right – oh dear! The design museum sits between all the flags, right on the waterfront, then its past Parliament House and the peace garden before heading up and over the bridge back towards the city centre. A really gorgeous and interesting 5km stroll for the early evening. Thanks Canberra!